I’m currently wading through critical theory but I read this article by a student who was lonely so they bought a kitten and I’m pretty cross. Firstly, I’ve grown up around animals. My parents both grew up with pets and our family got our first dog when I was three. Apart from one horrible week where none of us coped, we have always had at least one dog since. We’ve also had fish, rabbits, guinea pigs, rats, gerbils and stick insects. I’ve worked at a vet’s boarding kennels and cattery, and have also worked a bit with horses. 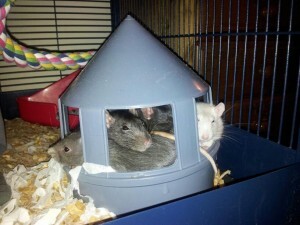 At the moment I have five rats who live in what my mum has affectionately dubbed “the Rat Palace” and enjoy a life of luxury. I believe that animals are good for us – they provide companionship and entertainment and relaxation. However, they’re also a commitment and I don’t think the article really addresses this. Most degrees last between three and four years. Lots of animals live longer than this and in the case of cats, as much as 15-18 years. What’s going to happen to the cat after you graduate? Animal rescues are already full – are you going to contribute to the problem? Bear in mind that if you adopt an animal from a shelter, it may have already experienced upheaval and abandonment. Pets can be expensive. You can get yourself into a nice routine of budgeting for food and bedding, shopping around for the best deal – but your pet can always get ill or get injured and vet fees are expensive. Somehow, animals always pick the worst possible moment to get sick. You probably won’t be eligible for PDSA vet care. You might choose to get pet insurance but read the terms and conditions carefully – alternatively, some people choose to put away some money every month into a vet fund. If you’re already struggling with money and living off beans and toast, please think very very hard about getting a pet. Many students will move house at least once during the course of their degrees and finding a landlord who allows pets can be tricky, especially if you have a dog or cat. I’ve always checked if they’re alright with “small caged pets”. Some people just don’t tell their landlord but you’ve got to ask yourself whether it’s worth the stress, hassle and risk of losing your deposit. It can also be difficult if you want to spend the holidays with parents. If they have pets, your animals might have to be carefully introduced and you’ll have to hope that they all get on. Your parents’ house might not be suitable for a dog or cat (on a main road, allergic family members, no garden etc). If you have caged pets, you either have to work out how you’ll transport the cage or set up another, holiday cage at your parent’s home. Please think very carefully about getting a “house pet”. It’s great if all your housemates are equally enthusiastic but who pays vet bills? who looks after the pet during the holidays? who does the not-very-fun stuff like cleaning out cages or litter trays? what happens to the animal when you stop living together? what happens if you disagree on an aspect of its care? Student loneliness is a problem – at one point, I had three contact hours a week as an undergraduate – but there’s more to owning a pet than just wanting one. There was no way I could have had a pet when I was an undergraduate; my life was just too unsettled and I couldn’t have cared for it properly. If you’re desperate to have some contact with animals and you have some experience of caring for them, you could always offer dog walking or pet sitting services, volunteer in a shelter or even temporarily foster an animal. There are much better ways of dealing with student loneliness than going out and buying a kitten. I am aware that the internet likes cats, so here’s hoping that it also likes rats. 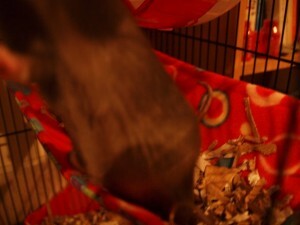 I am led to believe that Pebble dictates posts to an obliging Knotrune, but my rats, in true academic style, are unable to reach consensus on anything (except possibly that yoghurt drops are worth squabbling over and sundried tomato is foul, evil and proof that no one loves them). What you see there is a nice, new hammock made by Fuzzbutt Cage Comforts. 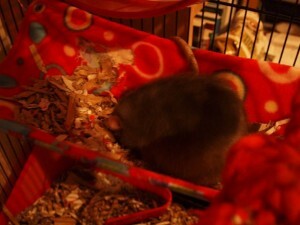 At some point today, the rats chewed a hole in the fleece, then proceeded to fill the hammock up with cardboard bedding. Just…why? 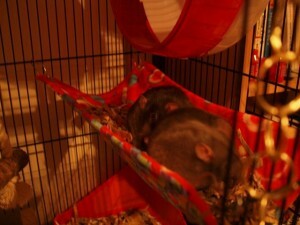 The way the cage is set up means there’s clambering and jumping involved to get into the hammock, the hammock is quite full of bedding, and they must have moved the bedding one mouthful at a time. Full marks for effort but just…why? I’m trying not to dwell on the sheer futility of their actions because it will only encourage me to draw a comparison with my own life of writing a 80-100,000 word thesis maybe four people will read. Much like the rats climbing up the bars and rope to tenderly deposit their carefully gleaned mouthful of bedding, only to scurry down again in a cycle that must have lasted Quite Some Time. Only their actions might result in a comfy bed, and mine won’t. Carry on, ratlets. I am in no position to judge you.